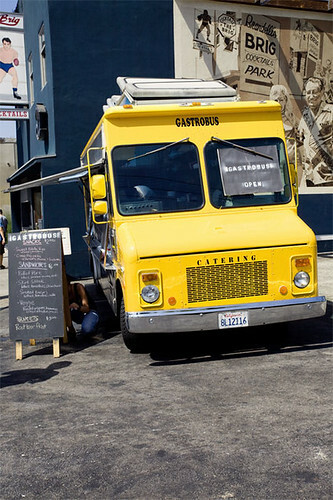 The Gastrobus is a 10 week old food truck run by husband and wife, Antonio (former chef for Wolfgang Puck) and Lana Medina. I was set to visit them on Sunday at the Los Feliz Village Farmers Market where they do the most awesome thing. Cook with whatever they find at the farmers market, keeping it local. I’m surprised with all the talks about shopping and eating locally this is the first food truck I know thats doing this. They have expanded this to Tuesdays now at the USC farmers market. So I was pretty damn angry after the whole “where the hell was Kogi?” incident in West LA. I was hungry for food trucks damit. So when I saw the big bright yellow truck parked at The Brig I was happy once more. But like so many other new food trucks there weren’t that many reviews or info on the internet about them. I read 1 or 2 good reviews but you can’t trust just 1 or 2 reviews. Basically my expectations for the Gastrobus was neutral. But oh wait, I brought my mom along and she is the pickiest person ever when it comes to food. After finding a street parking, oh yeah I can still parallel park, we walked to the parking lot of The Brig. 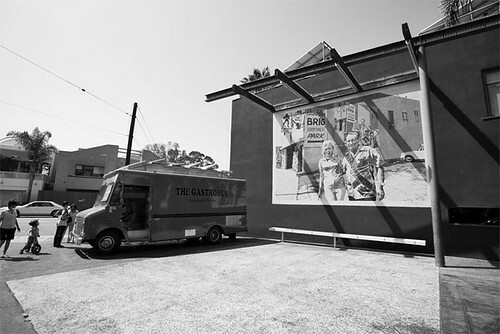 The Brig is a bar and allows food trucks to park in their parking lot. We stood in front of the menu for a bit. After few minutes of discussing what to order we finally made the final decisions. I was the one to order and I basically said 1 of each item on the menu please. Well not really. 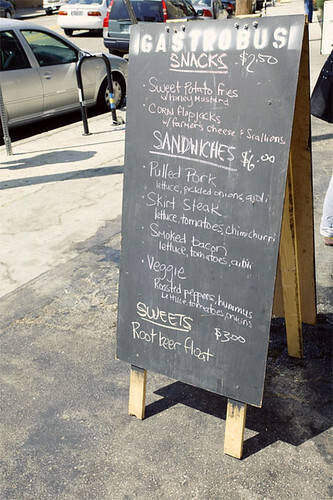 We got everything on the menu except for the blt and the root beer float. We’re gonna be so full after this one and it was only our first truck! While waiting for our food I chatted with Lana and learned that their Sunday farmers market menu was different because they use whatever they could find at the market. *Ding my name was called, time to eat! First up sweet potato fries. Antonio was SUPER nice enough to give us an extra order of fries while we wait for our sandwiches. 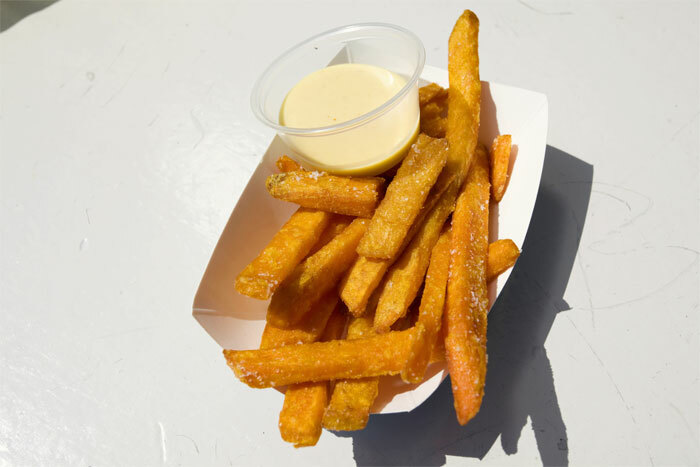 I love sweet potato fries but I hate that they’re always so thin. The ones from the Gastrobus were thick cut style which I love. Nice and crispy and soft in the center. Served with a sprinkle of salt and honey mustard. Oh soooo good. My mom couldn’t stop eating them nor could she stop smiling. Next up our sandwiches. I got the pulled pork with pickled onions. My sister got the skirt steak sandwich and our mom got the veggie sandwich with cucumber and roasted peppers. Here’s what my sister said about her sandwich. 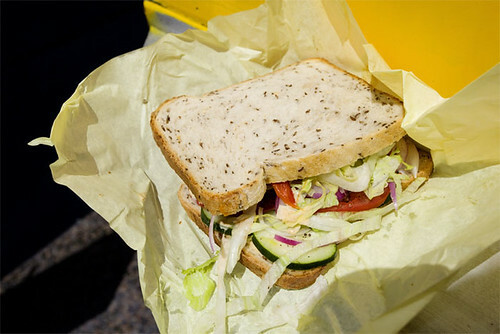 “The steak was cut up into chunks which makes eating the sandwich easier. The chimichurri was nice and tangy. 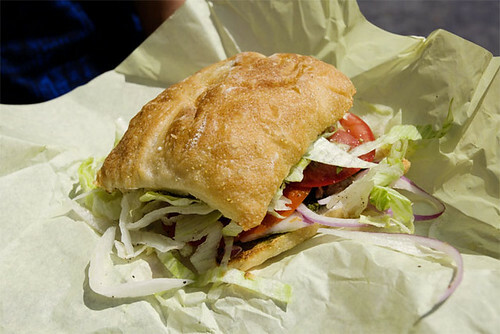 Overall a very good sandwich.” Our mom again was in love with her food, especially the roasted peppers. As for my pulled pork sandwich it was totally good. 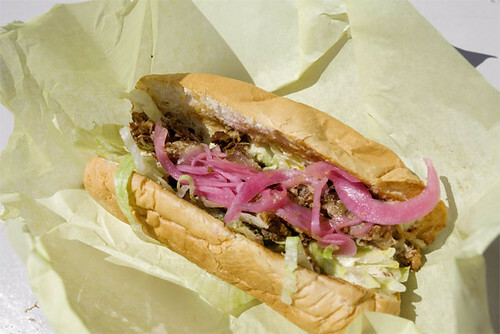 I’m starting to love anything pickled so that was a plus to have pickled onions on top of the sandwich. It had just the right amount of meat and the bread was soft but sturdy enough to hold everything together without turning into a big mess. 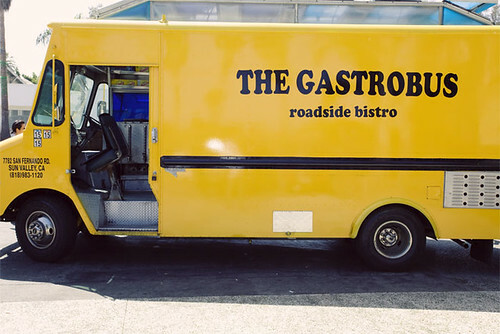 After all that awesome food, I had no idea how the Gastrobus will be able to top that but they sure did. 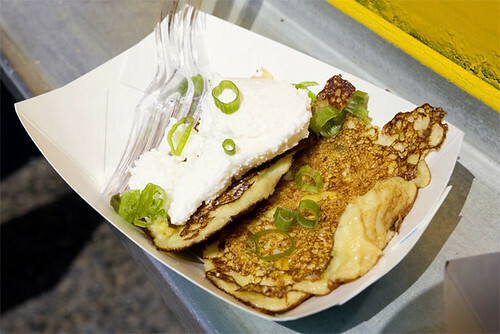 The corn flapjacks topped with cheese and scallions. Amazing. Just amazingly good. I can’t describe it. There’s just no way, you have to go and try it for yourself. After that I thanked Antonio and Lana for making my mom very happy. It’s rare for her to like everything but some how they did it. I applaud them. That made me excited to try their farmers market menu on Sunday.